Angels often function as messengers of God in the Bible. Perhaps the best-known example of this is Gabriel’s role in the Annunciation, a subject catalogued over two thousand times in the Index. He is identified by name in Luke 1:19, which describes him as saying “I am Gabriel, who stands before God…” as he brings word to the Virgin Mary that she will bear the son of God. 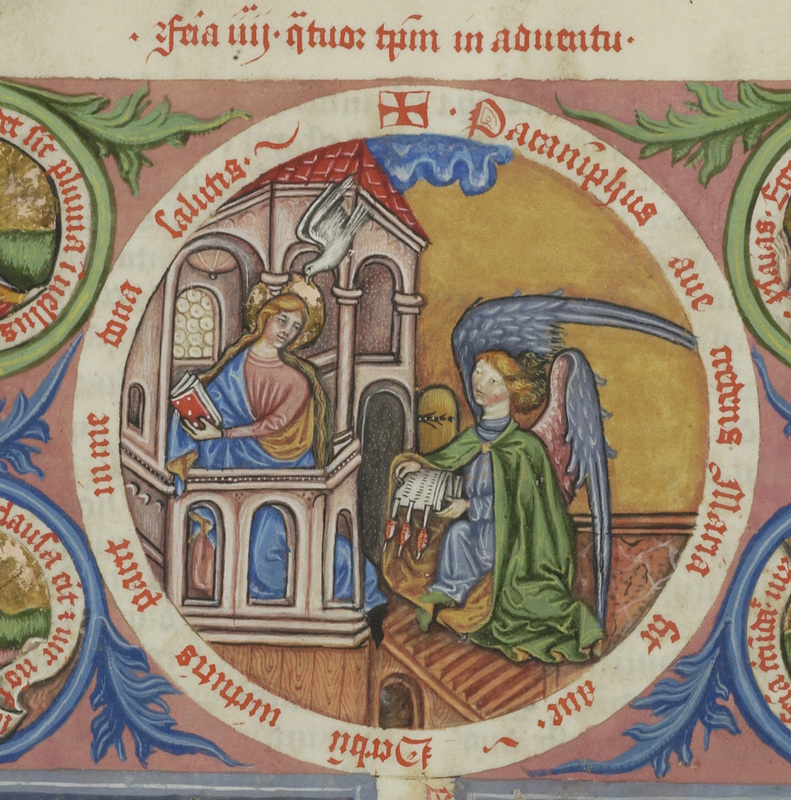 Throughout the Middle Ages, the Annunciation was depicted with varying degrees of complexity, and the means by which Gabriel brings his news varies as well. 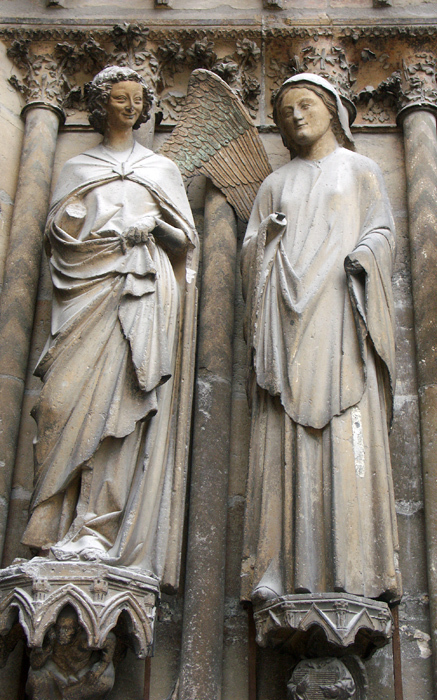 On the central portal of the Reims cathedral west façade (1245–1255), two statues of Gabriel and Mary stand next to each other, Gabriel smiling happily, Mary pensive. Here Gabriel offers nothing beyond a cheery expression, and very probably a gesture of blessing with his now-missing right hand. Yet the story was familiar enough that the two principals in close proximity would have triggered the memory of the Annunciation story for the viewer. In the slightly more elaborate scene from a sixteenth-century Gradual in Princeton University Library (Princeton 11, fol. 2r), Gabriel approaches from the left, with his right hand holding a scepter, a reference to kingship, and with his left hand indicating the dove of the Holy Spirit hovering above Mary’s head. No words are exchanged. Gabriel’s verbal message is implied by his symbolic scepter and gesture. The Annunciation, Book of Hours (Morgan Library MS M.893), fol.12r. Gabriel bears his message in an unusual and possibly unique way in the Morgan Library copy of the Concordantiae caritatis (M.1045, fol. 7v). The text of this manuscript was originally written by Ulrich von Lilienfeld, a Cistercian monk in Lilienfeld, Austria, sometime between 1351 and his death in 1358. It is a typological text relating saints’ lives, Old and New Testament topics, and moralizing texts about nature. The manuscript provides sermon material, and is arranged in the order of the church year. The Morgan copy was written and illuminated in Austria in the third quarter of the fifteenth century. 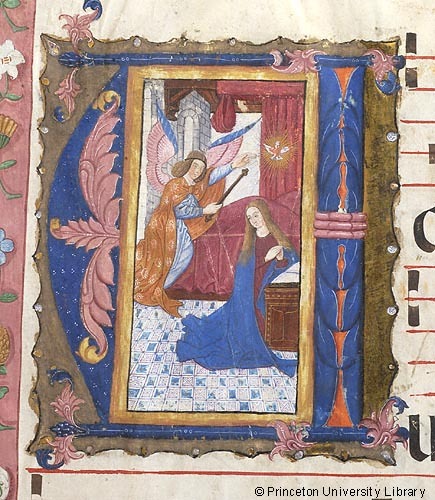 In the Concordantiae Annunciation, the Virgin Mary appears to be kneeling, holding an open book with both hands. A dove descends toward her head as she looks back over her left shoulder. 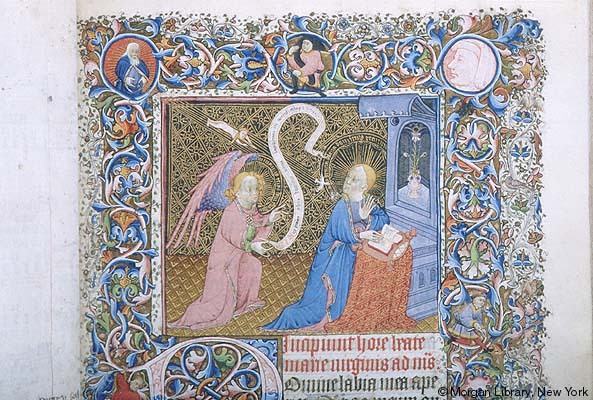 Her gaze is directed toward Gabriel, who kneels, both hands extending a partly folded document bearing three columns of pseudo-writing and three seals hanging from its lower edge. Why is Gabriel shown with this very unusual attribute? The answer may lie in the special format of Gabriel’s document, which resembles that of legal documents in the Middle Ages. The agreement was written on the page itself, while seals appended to the bottom served as the signatures of the parties involved in the contract. The number of seals depended on the number of individuals taking part. Since three seals appear here, it is not a great leap to imagine them representing the Trinity—Father, Son, and Holy Spirit. 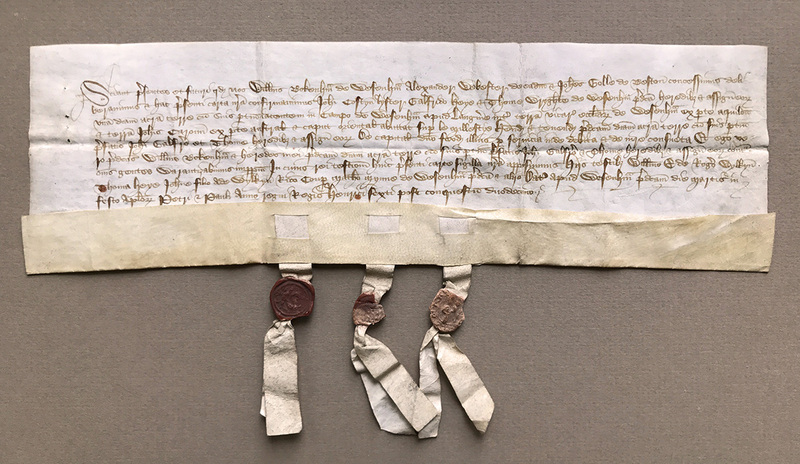 Is Gabriel delivering a signed contract to Mary, with the particulars outlined in three columns above the seals? Exceeding the traditional verbal greeting with which he communicates that Mary will become the mother of God, Gabriel here delivers a hard copy of a binding compact, leaving her no option but to accept.